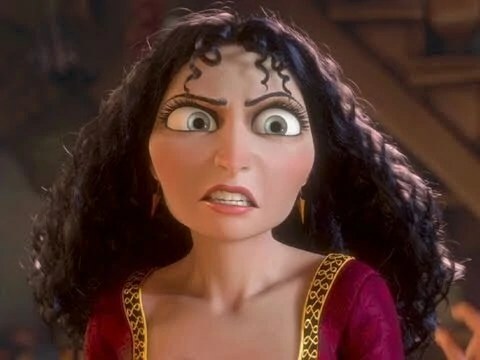 When I posted my review of Brave, I forgot to give Pixar my kudos for finally giving the world a curly-haired princess, and making her a strong heroine. Typically, women with curly hair are relegated to be villains like Mother Gothel in Tangled or Sideshow Bob in the Simpsons. So hooray for curls! As I was considering my oversight pointed out above (you’re welcome, Aimee), I also thought about how I said that Brave wasn’t a perfect film. And, if you can’t think of a solution for a problem, then you’re just complaining. So what follows are some ideas that I had that could turn Brave from a good film to a great one. I’ve seen a lot of mixed reviews about Brave. I just saw it and loved it. Don’t listen to the critics. Is it a prefect film? No. But few movies are. Technically, as with all Pixar films, it is extremely well made. The art of it is beautiful. The landscapes are gorgeous. The 3D enhanced things without bring intrusive. The voice acting was perfect. The story is not very original, but it’s solid, and the character of princess Merissa is pretty fresh. Most other characters are flat though. The world of the film is not big. It’s not an epic story. It seems like a chapter in a book of fairy tales, not a full novel. But those things don’t make it a bad film. It probably won’t make it a classic though either. But Pixar is a business built to entertain, not to churn it classic films, and I think they have succeeded. This is better than a popcorn flick churned out by so many studios. Probably the worst thing Brave has going for it is the mountain of successes that precede it from Pixar. As their first fairy tale, if it didn’t hit the ball out of the park, it’s a solid hit to advance the runners. That’s ask the team and the fans need, even though Some people only want then to setting for the fences. Is it okay to put baseball metaphors in a princess movie review? I recommend you take your kids, and take yourself. You won’t fall asleep like I have done in other animated features that I’ve taken my soon to. I’d even see it twice because I missed Easter eggs that I know are there. And there’s a quick scene after the credits if you can feet your kids to stay still after the credits. A final technical note… Our theater has the new Dolby Atmos sound system… One of 14 theaters that installed it for the release of Brave. I think the enhancements it brings are subtle, but good. I don’t think if they weren’t told that an average viewer would notice. But it added an aural texture that I appreciated, especially nice in the scene in the rain. And another note… I’m a bit upset that the toys for the movie give away the major plot points. I wish I had stayed spoiler free, but I saw the toys at Target. Grr. When I was in high school, I read Peretti’s This Present Darkness. I was an avoid reader at the time already, attending a private Christian school, and there’s been a lot of talk about it. For those who are unfamiliar, it’s a book about angels and demons and spiritual warfare. I guess it could be classed with other books that might be called urban fantasy. small bit of science fiction. The book tells the story of time travel and the impact on a married pair of magicians. The Orlando Sentinel posted an article that says the building that housed Dixie Stampede is going to be demolished to expand the outlet malls across the street. Simon Property Group wants to raze Dolly Parton‘s Dixie Stampede dinner theater to expand its nearbyOrlando Premium Outlets mall. Orange County recently reviewed plans for the project, which will add 100,000 square feet to the 550,000-square foot complex across Vineland Avenue. Two buildings will be added. Simon must make some technical changes to its application before getting final approval, county planning administrator John Smogor said. Simon has not yet purchased the property but is expected to close on it soon. Word on the street is that the Hunger Games Dinner Adventure could not be retrofit into the original building. While the Simon group does indeed want additional shopping to be added, the addition of two buildings implies that this new facility will be customized to meet the technical requirements of the show. This obviously delays the introduction of the Hunger Games Dinner Adventure, and explains why the press release was pulled from http://www.prnewswire.com/.